Will the Dollar Remain Dominant? Argentina: A Rock and a Hard Place? Mexico – Increasingly Attractive Investment Fundamentals? Japan’s Bio-Tech Venture: Tsunami or Just a Bubble? Advertisers in this Edition: AsiaLinks, Asia Times, Asia Today, Asian Business Watch, Business Promotion Asia, Buyside Magazine, Coudert Brothers, eMergingPortfolio.com, FacilityCity, The Gloom Boom & Doom Report, Global Credit Solutions, Ltd., India Infoline, Indonesian Business, J@panInc, Site-by-Site, vfinance.com and Wee Beastie. © 2003 KWR International, Inc. Radical Islamic terrorists strike at targets in Saudi Arabia, Morocco and Israel, North Korea continues to bluster with its finger close to a nuclear weapons trigger, Iran is attempting to develop its own nuclear weapons program, and Iraq remains unruly, with the rule of law still lacking in the country’s major cities. The U.S. dollar is falling, the Euro and Yen are going up, and one of Japan’s major banks appeals for government assistance to stave off a failure. Economic data from Japan indicates that a double dip recession is an increasing possibility, while trends in Europe point to the same direction. The German economy is looking at unemployment creeping over 11%, while the French government must contend with fiscal slippage, the pressing need to bring the pension and benefits systems cost under control, and the strong hand of unionized labor being manifest in a major national strike. The stock market euphoria that was evident in April and the early part of May, is increasingly fickle. Although most investors really enjoyed the long-deserved and distantly remembered “feel-good” sensation of watching the Dow, NASDAQ and FTSE tick upwards, the solid foundation for a sustained bull market – as well as corporate health and increased capital spending are still lacking. As we have stated before the economic recovery is going to be gradual and painful. In the United States, the recession is over, but the ability to construct a strongly sustainable recovery remains a challenge. The consumer is tired and the corporate sector still is not spending. Worse yet, unemployment hovers around 6%, making it feel like as though the recession is still here for many Americans. Adding to the sense of uncertainty, there is growing concern about deflation, broadly defined as a reduction in the level of national income and output, accompanied by falling prices. It has been partially caused by excess capacity in industries from automobiles and telecommunications equipment to banking and airlines. Another factor is the manufacturing machine that China has become: China’s cheap labor and exports have forced many other manufacturing countries to lower their prices to remain competitive. While a little bit of deflation is not necessarily a bad thing as it can balance past bouts of inflation (or hyperinflation in some parts of the world), the fear is that the current type evident in Japan and Europe could make things much worse in the United States. If the U.S. economy slips into a new recession, the already struggling global economy will stagnate. What must be done to put the global economy back on track? First and foremost, the U.S. economy needs to maintain growth above 2% in 2003 and increase that pace in 2004. For that to occur some form of tax reform/budget stimulus must pass the U.S. Congress and be implemented, interest rates remain accommodative (we expect one more cut in June), and capital spending resume (this may be the toughest to occur). Equally important, but in a medium term timeframe, Europe needs to regain some degree of economic momentum. This implies a more accommodative stance by the European Central Bank -- which has been more obsessed with inflation -- a willingness to implement badly needed, yet unpopular, pension and benefit reforms, which are necessary due to demographic and fiscal pressures. It also requires greater leeway on the fiscal front as the current EU target of a maximum allowance of a deficit of 3% of GDP is clearly not helping and can in fact be argued as a contributory factor to growing deflationary pressures. Germany, in particular, is vulnerable to deflation – it lacks an ability to cut interest rates, push up fiscal spending and its banks are in a weak condition. Rounding out the picture, it is important that China continues to grow at a rapid pace of above 6%. SARS has clearly put a crimp in China’s strong GDP performance for 2003, but it could also result in some positives for the Asian country in terms of improving the national health care system and upgrading sanitation practices. This would certainly help to contain SARS and reduce the potential outbreak of new diseases. As for Japan, the problems remain – a troubled banking system, anemic economic activity, a large and mounting national debt, and an embattled government seeking to move ahead on reforms against entrenched opposition. We do not see Japan imploding, but the economy will remain a challenge for the government and a point of concern for the community of international policymakers. The May government intervention in Resona Bank, which is a de facto nationalization of the country’s fifth largest bank, does provide an opportunity for the Koizumi administration to break the logjam in the terms of the banking sector. It appears that Resona’s top management is to resign, providing the government with an opportunity to appoint reformers. If this transpires, Japan’s fortunes could begin to look up. The bottom line on the global economy and stock markets is that we continue to live in fear. There is a long shadow looming over the landscape – deflation. It is a major factor in Japan, the world’s second largest economy, and it is increasingly being mentioned as a point of concern in Germany and the United States. The saving grace thus far has been that the U.S. economy continues to grow – albeit far too slowly to remove the fear factor. We still expect US real GDP growth of 2-2.4% for 2003, with a pick up to 3.0-3.3% in 2004. Key triggers going forward include the passage of a stimulus-oriented budget in the US, interest rate cuts in Europe and the United States, and some reduction in global excess capacity. However, if the proper measures are not taken in the United States and Europe, deflationary measures on the global economy will mount. The nervous market over-reaction to deflationary fears will become a reality and we will then really be living in fear. The dollar has followed a rocky road in recent months, tumbling to nearly $1.18 against the resurgent euro and to an anemic 119 yen, as foreign investment in both bricks-and-mortar and portfolio investment in the States has ebbed. If the foreign exchange rate is essentially the bottom line of the country, then investor sentiment toward the once-mighty U.S. dollar – and the economy that underpins it – is definitely cooling. But while day-to-day currency movements remain well-nigh unfathomable, there has been surprisingly little structural change in the FX markets, even over the past decade. The dollar may be slipping in value, but it continues to dominate the markets in other, perhaps even more important, ways. The arrival of the euro in 1999 was supposed to herald a new era in which dollar dominance of the FX arena gradually gave way to a more equitable distribution of power among a tri-zone currency world (dollar, euro, and yen). This has not happened. According to the most recent report by the Bank for International Settlements (BIS) on FX market activity, published in 2001, within the tri-zone world the dollar still reigns supreme. A whopping 90% of all currency trades still include the dollar on one side of the deal; by contrast, the euro figures in just 38% of all FX transactions. The potential for internationalization of the euro – its use in transactions not involving the 12 component countries, and therefore its ability to challenge the dollar’s dominance of global FX markets – remains murky. As a general rule, this potential may be assessed in three ways: the euro’s use as a medium of exchange for Europe’s trade with non-European countries; its role as a store of value for stocks and bonds on world capital markets; and its use in official FX reserves held by the world’s central banks. By these yardsticks, the picture is mixed. Role in world trade: The U.S. accounts for only 14% of world trade, but the dollar is used to invoice close to 50% of the world’s exports. Clearly, there is room for the euro to play a much bigger role in world trade. Countries with close political, economic and financial links to the eurozone, like those in central and eastern Europe as well as some former colonies in Africa, may move toward the euro as an anchor currency. This would result in the emergence of a broader, informal “eurozone” encompassing countries well beyond its official limits. Role on international capital markets: The introduction of the euro, clearly, is playing a big role in broadening the depth, liquidity, and appeal of European capital markets. In 1999, euro-dominated bonds accounted for 45% of all bonds issued on international markets, slightly outstripping the 42% of bonds issued in dollars. This could presage the evolution of the euro into a safe-haven currency over time, as investors assess the strength and stability of the euro as well as the credibility of the European Central Bank. Role in official reserves: The dollar accounts for 57% of global FX reserves, and central banks have been loath to trade in their dollars for euros thus far. Political issues may eventually hasten this movement, but the huge bulk of FX reserves held in Asian central banks (China alone is holding around $200 billion) are conservatively managed. Given the initial weakness of the euro, and lingering doubts about the long-term viability of European monetary integration, it seems unlikely that the euro will challenge the dollar as a reserve currency for the foreseeable future. So FX markets are still largely dominated by dollars. What else has not changed on FX markets? The birth of the euro led some observers (mostly French and German) to predict that London would experience a gradual decline in its importance as an international financial center, to be replaced by Frankfurt and Paris. This, too, has not happened. London continues to handle close to 1/3 of FX trading activities, far more than any of its competitors, and the institutional skills and infrastructure in the City of London command a hefty competitive advantage in the FX business. Trading in “exotic” currencies, too, was supposed to take off. Faced with liberalization and deregulation in emerging currency markets around the world – and faced simultaneously with the need to replace lost opportunities in intra-European currency trading – many traders looked to exotic currencies as the next frontier. A decline in trading activity and increased efficiency in markets for the mature currencies of western Europe and North America (the euro, after all, is entirely about removing market inefficiencies) threatened FX trading profitability. Fortunately, at the same time governments in Asia, central and eastern Europe, Latin America, and even Africa were enthusiastically opening their markets to foreign capital. The result seemed inevitable. First, the possibility of a serious decline in market liquidity is worrisome. FX market participants have complained in the past couple of years that liquidity has become erratic. The rise of electronic brokers, consolidation within the banking industry, and the higher level of risk aversion among global hedge funds all contribute to this trend, and make it increasingly difficult to predict when these pockets of illiquidity will occur. Second, the FX markets may prove more herd-like than ever, as trading business is more and more concentrated among a few large players and the big macro hedge funds play a cautious role. This may, in turn, presage more sudden and dramatic currency swings.∑ Next, the markets may prove more inexplicable than ever, stemming from the growing influence of equities, and merger and acquisition activity, in currency trading. Traditional reliance on fundamental macroeconomic factors to predict FX movements is increasingly discredited in this environment, but it is far from clear what can replace this methodology. Finally, trading volumes will probably rebound after the period of consolidation at the end of the 1990s. Once the fallout from the emerging markets crises of 1997-87 is fully absorbed and the euro finds its rightful place in the markets, the inexorable march of globalization and resulting rise in cross-border capital flows will be reflected in higher turnover on FX markets. But buyer beware: The larger and more unwieldy the market becomes, the less responsive it will be to government intervention – and the easier it will become for traders to destabilize currencies of smaller and vulnerable emerging market countries. That the world’s economic geography changes from time to time is nothing new and has been a common feature of human progress and development throughout the ages. Herodotus already observed in the 5th century BC that, “the cities that were formerly great, have most of them become insignificant; and such as are at present powerful, were weak in olden times”. In fact, it is remarkable how uneven economic development has been since ancient times with a great number of cities, countries and civilizations having flourished and decayed – but at different times and in different regions of the world. In early history the major clusters of wealth such as Thebes, Babylon, Persepolis Nineveh, Bactria, and Samarkand were mostly located around the Nile, Euphrates and Tigris rivers and along the Silk Road. However, with the rise of the seafaring Phoenician trading empire a shift in the centers of prosperity and power toward the Mediterranean Sea took place, which led at different times to the rise of cities like Athens, Tyre, Carthage, Alexandria, Rome, and Constantinople, and finally culminated in the 15th century with the first centers of capitalism – the Italian trading cities of Venice, Florence, Pisa and Genoa. But, when the Portuguese Vasco de Gama discovered in 1498 a new trading route to Asia around the Cape of Good Hope and with the Spanish conquest of the Americas, trading routes shifted away from the Silk Road and the Mediterranean Sea, and threw Venice, as Montesquieu observed, into a corner of the world where it has remained. With the rise of the Portuguese and Spanish Empires and later with the Dutch trading hegemony the clusters of wealth shifted to cities like Lisbon, Cadiz, Antwerp and Amsterdam in Europe, to Goa, Malacca, Macao and Batavia in the East, and to Mexico City, Potosi, Lima, Bahia and Havana in the Americas. The Industrial Revolution and the rise of the British Empire in the late 18th and early 19th century brought once again huge changes in the world’s economic geography as cities such as London, Manchester, Birmingham, Lancaster and Liverpool in England, and Calcutta in the East displaced the old centers of commerce, which had flourished under either Spanish, Portuguese or Dutch rule. Then, in the late 19th century and especially in the 20th century, the rise of industrial and commercial centers in the US - first all located along the east coast but then shifting to the Great Lakes region and the west coast displaced the early English manufacturing centers. Clearly, throughout the ages, economic growth and development has been extremely uneven whereby major changes in the world’s economic geography were driven by new inventions, discoveries and social events. New inventions such as the compass, shifted trading routes from land to sea and led in the 15th century to the discovery voyages, which enlarged the world’s economic sphere several-fold and relegated the until then rich Mediterranean cities into a backwater. The construction of canals and the invention of the steam engine, steel, railroads, tractors, cars and electricity permitted the opening of landlocked territories for agriculture and industries, which led to the rapid rise of many totally new manufacturing and commercial centers, which were landlocked, in the 20th century. New industries frequently also increased the demand for commodities, which brought prosperity to cities near large resource deposits such as Manaus for rubber, and to Houston and Dallas for oil. But throughout history cities did not only become rich because of a favorable location, which was conducive to trade, the proximity to skilled labor and abundant resources, which facilitated industrialization and the exploitation of natural resource, and in the case of Rome through sheer military power. What were also required were a skilled administration, a well-established legal and commercial infrastructure, low taxes, and most of all religious tolerance and freedom, which attracted dynamic minority groups, and scientists, artists, teachers, philosopher and inventors. Conversely cities decayed because of internal and social strive, costly military campaigns in order to maintain their trading empires or other commercial interests, protectionism, their inability to adapt to changing economic conditions, and intolerance towards minority groups, which led merchant families or religious minorities to leave. Competition from the opening of new territories or from new industries as well as infectious diseases was also frequently an important factor. The Black Death caused by the Pasteurella pestis, which made its first appearance in Europe at the port city of Kaffa in 1346 when it was besieged by the Mongol leader Kipchak Khan Janibeg who catapulted dead bodies into the city (the first recorded case of biological warfare) quickly spread to all the port cities of the Mediterranean and European trading centers and reduced in the second half of the 14th century the European population by close to 40%. The death toll from the plague was naturally far higher in densely populated trading ports and accelerated their economic decline. In fact it was only in 1550, more than 200 years after the outbreak of the pest at Kaffa, that Europe’s population again reached pre-plague figures, whereby renewed plague epidemics ravaged Venice also in 1575 and 1630. Or consider the economic and social impact of the infectious diseases, such smallpox and influenza, which were brought along to the Americas by the conquistadors. Prior to the conquest by Cortez the Mexican civilization numbered over 20 million, but the Aztecs lacking any acquired immunities to the new infectious organisms were decimated within 50 years to just 3 million! We can therefore, see that Hong Kong suffers at present from both a structural shift in the world’s economic geography and a plague, about whose virulence and duration little is known. Following the breakdown of the socialist and communist ideology in China and the Soviet Union, and the end policies of self-reliance and isolation on the Indian subcontinent the world’s economic sphere was enlarged by as much as at the time of the discovery voyages, since more than 3 billion people joined the global market economy and capitalistic system. This means new competitors for more recent centers of prosperity, such as Hong Kong, Taiwan, South Korea and Japan, which benefited for as long as China was a closed society under socialist policies. The same way manufacturing shifted in the US from the East Coast to the Great Lakes following the construction of canals and railroads in the 19th century, the opening of China will lead to a massive relocation of production, commerce and financial markets to the mainland with Shanghai likely to regain the pivotal position it enjoyed before the communist takeover, and other provinces undermining the manufacturing sector of the Taiwanese, South Korean, Japanese and Hong Kong economy. In addition to this ongoing major change in the world’s economic geography, which is also taking place in Europe as a result of the breakdown of the Soviet Union, Hong Kong is now increasingly vulnerable to infectious diseases whose most fertile breeding ground is located in Southern China where humans mingle densely with wild and domestic birds, and livestock. Fortunate in the case of the 1997 bird flu, which could not jump from human to human, and was, therefore, contained by killing a million chicken, Hong Kong is now faced with its most serious crisis since the 1967 riots due to the SARS causing virus, which most likely jumped from pigs to humans but can now also be transmitted among humans. Surely, Hong Kong will survive both the increased competition from a large number of new commercial centers in China and the SARS pandemic. 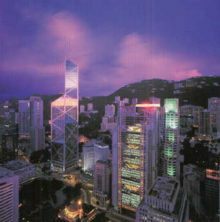 But, these two major outside shocks, which in the case of the increased competition from China will not go away, and in the case of infectious diseases may recur from time to time will likely reinforce the relative decline of Hong Kong’ economic and financial power compared to other cities in Asia and in particular in China. FacilityCity is the e-solution for busy corporate executives. Unlike standard one-topic Web sites, FacilityCity ties real estate, site selection, facility management and finance related issues into one powerful, searchable, platform and offers networking opportunities and advice from leading industry experts. Following the AKP’s (Justice and Development Party) overwhelming victory in last November’s general elections, party leader and now prime minister, Recep Tayyip Erdogan, promised sweeping human rights reforms and economic measures to comply with the EU’s political and economic criteria to enable Turkey to begin membership negotiations. He believed that Turkey was entitled to a date to begin talks since other candidate countries had not fulfilled the criteria in full when they had begun their respective negotiations. At the time, he stressed the mutual interests of both the EU and Turkey, with the republic’s membership as an example to the Muslim and western worlds that democracy and Islam can co-exist. Erdogan also went so far as to endeavor to implement outstanding rulings by the European Court of Human Rights, identified as a serious issue by the European Commission’s regular progress report on Turkey, removing restrictions on freedom of expressions and conscience, and allowing non-Muslim religious foundations to own real estate. During December’s Copenhagen EU meetings, while the proud Danish government concluded final preparations for the entry of ten new member states, despite the best of intentions, the Erdogan government discovered it would have to wait until December 2004 to learn if its planned reforms would meet the EU’s criteria for membership. The European Council leadership resolved to review Turkey’s progress on human rights, democracy, and treatment of the Kurds prior to that date and would begin negotiations "without further delay" if EU standards in those and other areas were met. That resolution, in part, arguably came about following the Turks’ withdrawal of their long-standing veto over the use of NATO resources by the EU military rapid reaction force. In the end, Erdogan reluctantly accepted the December 2004 date, despite the Bush administration’s strong lobbying tactics for a faster time-table for Turkey’s accession. The Bush push had been urgently initiated in the wake of the 9/11 tragedy and ahead of the then Iraqi invasion plans as a means to demonstrate the benefits of reform to the Islamic world. Also contributing to the Turks’ displeasure was the EU leadership’s support for Bulgaria and Romania to join the community by 2007.
the ability to take on the obligations of membership including the adherence to the aims of political, economic, and monetary union. While aware of these strict criteria in relation to Turkey’s recent economic, political, and social experience, the Erdogan government realizes there is still much to do, although some progress has been achieved. The planned EU enlargement to absorb ten new member states will create a trade bloc of twenty-five nations, a total population of 450 million and an economy of $9.4 trillion, closely matching that of the United States. Following a string of national referendums, the ten candidate countries are scheduled to join in May 2004. Soon thereafter, they will elect members to the European Parliament and within the next few years, the majority, if not all, are expected to adopt the Euro. The ten states are Malta, Cyprus, Slovenia, Czech Republic, Poland, Hungary, Slovakia, Estonia, Latvia, and Lithuania. The EU’s 10 new member states may not welcome the prospect of eventually sharing community transfer payments with Turkey, a much larger country with a lower per capita GDP. Should Turkey begin serious membership negotiations in early 2005, it may not complete such negotiations for another eight to ten years and by then it could have a population in excess of 80 million. That would make it the EU’s largest member and among its poorest. However, Turkey’s young population could arguably become an advantage for the EU’s growing imbalance between retirees and workers. Yet, its different cultural and religious traditions would dramatically change the face of Europe. Among the ten new members will be Cyprus, which has been divided since 1974, when Turkey sent troops to repel a Greek-sponsored attempt to take over the island that gained independence from the U.K. in 1960. In 1983, the Turkish-held northern portion declared itself an independent republic, but Turkey remains the only nation that recognizes the separate union. A nine-nation UN peacekeeping force continues to guard the 120-mile ‘Green Line.’ Several attempts for a resolution of the partition have failed, with the most recent occurring this March. Turkish Cypriot leader Rauf Denktash then rejected a U.N.-sponsored plan, championed by General Secretary Kofi Anan, that proposed a combination of compensation and limited restitution to the Greek Cypriots. The talks failed because of disagreements over land and population exchanges. That ended hopes of a united Cyprus that would join the EU in May 2004. However, Turkey is now reportedly working on a plan to transfer to a compensation board in the northern part of Cyprus several thousand Greek Cypriot property claims that would have otherwise been sent to the European Court of Human Rights in Strasbourg. As another positive measure, Erdogan surprisingly convinced Denktash to lift the travel ban between the two regions in late April. As a result, more than 300,000 people have since crossed the ‘Green Line.’ The reported majority of the border crossings have been made by Greek Cypriots visiting their former homes, with most Turkish travelers seeking employment in the south. Erdogan is reportedly ready to lift the trade ban on Greek Cypriots and urged Greece and the world community to lift trade restrictions that are economically strangling Turkish Cypriots who have a per capita income of less than one-third of the Greek Cypriots. Despite this gesture, he still insists on the continuation of the two autonomous Cypriot communities. Although Greece has backed Turkey’s bid for EU membership, Turkey still fears that Cyprus, as an EU member, could veto its eventual membership. Six months after an overwhelming electoral victory, the AKP has disappointed many as its experiment to reconcile Islam and democracy continues to struggle. The party’s inexperience and mistrust of the political establishment have prevented it from reaching many of its reform goals. The authorities’ reported unsatisfactory response to the aftermath of the earthquake on May 1st in the Kurdish majority province of Bingol, similar to past governments’ tardy responses to natural disasters, led to outcries from the opposition and clashes between police and local demonstrators who were protesting shortages of tents, food, and other emergency supplies. As expected by many analysts, AKP-driven relations between the secular state and Muslim society have become increasingly strained. This was most evident when the division in parliament caused the recent refusal of the U.S. request to deploy troops within Turkey for the Iraqi campaign. AKP’s biggest challenge remains the powerful military, which is very wary of further reforms that would challenge its influence as the proud guardian of Turkey’s secular traditions. AKP carries the heavy baggage of the Islamic movement’s previous failed attempt at democratic leadership. Erdogan’s former mentor, Necmettin Erbakan, who also promised to respect the republic’s secular system, found himself deposed by the military just two years after becoming prime minister in 1997. Erdogan and others abandoned Erbakan and established AKP on a political platform of democratic reforms with the goal to achieve EU membership. The spotlight is also now on the AKP to see whether it will act on its promise to pursue incomplete IMF dictated structural reforms that were previously agreed to by the former government. Those reforms range from mass privatization to direct foreign investment schemes designed to eliminate two of Turkey’s chronic ailments: the suffocating debt trap and double-digit inflation levels. Such an overhaul is paramount for Turkey to satisfy the EU’s economic conditions, in addition to political criteria for membership. It remains to be seen how successful the Ergodan government will be in those efforts. We expect it to be a long road to climb. The choice between former President Carlos Menem and leftwing governor Nestor Kirchner in Argentina, the two presidential candidates to qualify for the second round of voting, was always depressing. The outcome is worrisome, too: Menems abrupt withdrawal (in the face of certain defeat) handed Kirchner a presidency that is tainted from the very beginning. At any rate, now the course is set, so it is time for the markets to render their verdict. The stock market actually dropped 8 percent the day after the first round of voting, which set the stage for a second round runoff between the widely discredited and unpopular Menem  whose financial mismanagement is widely viewed as paving the ground for Argentinas financial collapse of 2001  and Kirchner, an unashamedly unreconstructed Peronist whose economic plan actually drove business leaders into the Menem camp. The denouement, giving Kirchner the presidency without the legitimacy of an electoral win, can hardly be viewed as a victory for Argentine democracy. In fact, the peso fell by over 5 percent in the days following Menems withdrawal, reflecting widespread dismay with the result. Kirchner takes office on May 25 as Argentinas sixth president in 18 months; his mandate consists of the 22 percent of the vote he received in the first round. A commitment to give the state a bigger role in the economy, partly by implementing massive job creation programs fueled by government spending on infrastructure projects. He has talked of a program to build three million new homes, which will create five million jobs in an effort to bring down the 20 percent-plus unemployment rate. On the positive side, Kirchner is taking over at a time when Argentinas much-battered economy is actually showing some tentative signs of life. The country will run a healthy trade surplus in 2003 (partially thanks to a more competitive exchange rate), the budget is showing a primary fiscal surplus, growth is put at 4% for the year (after an 11% decline in 2002), and there has been no sign of the much-dreaded hyperinflation that accompanied past currency devaluations in Argentina. Both the central bank president and Economy Minister Roberto Lavagna  who is viewed as the man behind this burgeoning recovery  have pledged to remain in office under a Kirchner government. However, much of this progress can easily be undone. Both the trade surplus and the lack of inflation reflect, in large part, the moribund state of the Argentine domestic economy. Any revival in domestic demand  especially one fueled by spiraling government spending, as Kirchner suggests  is likely to invite both higher imports and higher prices (not to mention a return to government deficits). Moreover, Kirchners approach is unlikely to foster a prompt reconciliation with Argentinas foreign creditors, who are still reeling from the countrys $95 billion default in December 2001, the biggest sovereign default in history. Argentina cannot move forward until the issue of its $170 billion debt, the equivalent of nearly 140 percent of GDP, is resolved. With the best will in the world, devising a repayment mechanism will be unspeakably complicated  especially since more than $55 billion of the bonds are held by overseas investors, many of them retail investors. Again, in stark contrast to Lula, Kirchners rhetoric suggests that he may not have the best will in the world. Under these circumstances, negotiations will be lengthy, intense, and difficult. In the end, of course, Kirchner will have no choice but to reach some accommodation with the foreign creditors  but the process looks to be painful. On the domestic front, Kirchners reputation as an old-line, unreconstructed Peronist (a party hack in American terms) may also presage trouble. The deeply divided Peronist party will find it difficult to sustain any kind of congressional momentum, especially if the nascent recovery proves to be short-lived. Kirchners uncertain mandate will buy him little support in the congress, nor does he have any support base among the countrys powerful provincial governors. In this environment, Kirchners prospects for reforming the deeply troubled domestic financial system  essential if companies are to regain access to credit and jump-start a real recovery  are also poor. Despite all of Menems baggage, he probably would have been the lesser of the two evils at this point in Argentine history -- from the financial analysts point of view. But the voters have turned their backs on Menems shady past, and chosen to move forward with Kirchner. The best possible outcome would be a Lula-style conversion for Kirchner once he is in office. Optimists hope for a form of smart populism that would vindicate the voters choice and propel Argentina forward into the new century. As yet, though, there is little sign of this. The worst outcome  a legitimacy crisis that will remove Kirchner from office well before his term is up  seems like a better bet. Mexico's credit fundamentals are improving  albeit at a slower pace than in previous years. Reflecting this, Moody's has recently changed the outlook to positive and the Latin American country could benefit from any extended complications with SARS in Asia. Mexico remains a relatively low cost producer of many goods and has excellent proximity to the U.S. through NAFTA. Despite the slight contraction in first quarter 2003 real GDP, there are signs that parts of the economy are beginning to gain momentum, a trend which could strengthen when the U.S. recovery becomes more pronounced. 1. Inflation forecasts are heading down. In early 2003, inflation for the year was expected at 4.3%. The central bank's tight monetary policy, however, is having a positive impact, as consensus estimates for inflation have been lowered to 3.9%. Considering that Mexico's inflation levels were well over 10% throughout the 1990s, this is positive news. For the first 15 days of April, inflation was just 0.01%, the lowest biweekly reading since April 2002. Inflation had picked up in the late part of 2002 due to the steep depreciation of the peso bled through into prices. 2. Retail sales were up 4.2% in February, well above expectations and another sign that the worst of the recession may now be over. Sales growth in basic consumer goods has been relatively healthy for several months now. Big-ticket items have lagged. After having fallen year-on-year for five of the six months between August 2002 and January 2003, auto sales were up a respectable 2.1% in February. It is expected that auto sales are likely to continue to show ongoing strength in March. 3. Higher than expected oil prices have been a major windfall for Mexico and will help the government make its fiscal target of a budget deficit equal to 0.5% of GDP. Higher oil prices and better tax collection measures bore fruit in the first quarter of 2003, as federal revenues rose 21%. Mexico has now accumulated a 27.2 billion peso ($2.7 billion) surplus. The government budget estimates the price of Mexican oil will average between $23-24 a barrel, helping the state to take in 14 billion pesos more in revenue this year than initially forecast. 4. We expect Mexico's external accounts will remain off of investors' radar screens. Mexico's current account deficit will be equal to 2.5% of GDP, which should easily be financed by foreign direct investment (FDI). It will also be an improvement on 2002's current account deficit of 2.9% of GDP. FDI is forecast at $14 billion for 2003. In addition, Mexico has done its financing in the bond market already this year and does not need to return. 5. There should be increased political noise as Mexico heads to the July 6, 2003 congressional elections. However, the political risk associated with the election is low. Both the party of President Vincente Fox, the PAN, and the major opposition party, the PRI, share a broad consensus on economic policy. Indeed, the PRI long dominated Mexico's political life and the last three presidents, prior to Fox, advanced much of the structural reforms that provide the economy its current foundation. Consequently, if the PRI were to win the congressional elections in July this would not represent a major shift in terms of policy. It could result in more politicking between Congress and the Presidency in terms of making deals to pass key legislation in the second half of Fox's term. The PAN is coming in around 38% in opinion polls over 37% for the PRI, while the left-of-center PRD is polling around 20%. Such an actualization of the vote would leave the Congress much as it now - an arena where the PAN must form tactical alliances with the PRI to pass legislation. Mexico has made considerable strides from the bad old days of debt default during the 1980s. Although challenges remain, Mexico remains one of the stronger sovereign performers, a trend that should continue. The trick for Mexico is to maintain fiscal discipline during the period that it takes the United States economy to regain stronger and sustained momentum. When the U.S. recovery eventually comes, the country just south of the Rio Grande will be a strong position to take advantage of improving macroeconomic conditions in North America. Japans Bio-Tech Venture: Tsunami or Just a Bubble? In the wake of an anemic economy and a short-lived boom in e-commerce before the collapse of the global Internet bubble, Japans national and local governments struggle to retrofit the economy for the 21st century. While closing companies outpace the number of new companies, national and local governments are taking steps to encourage entrepreneurs to develop new businesses. There are hopes that bio-tech or BT can help to revitalize the Japanese economy. Japans Kansai region is hoping that BT can do just that. At the heart of Kansai, Japans second city of Osaka has been burdened by the national downsizing and the hollowing-out of manufacturing industries. Kansais unemployment rate outpaces Tokyos and as the region struggles to redefine itself amidst vanishing jobs and businesses, Kansai hopes BT ventures will spawn growth. At the center of Kansais BT movement are projects such as the Kobe Medical Industry Development Project (regenerative medicines and medical devices), the Saito Life Science Park (new drugs by genome and protein analysis), and the Wakayama Bio Strategy (agriculture related BT). Kansai aims to be Japans international life science hub. It can be said that Kansais BT projects are not out of character given the regions existing pharmaceutical interests. Roughly thirty percent of Japans pharmaceutical industry locates there, including firms such as Takeda Chemical Industries, Fujisawa Pharmaceuticals, Tanabe Seiyaku, Sumitomo Pharmaceuticals, Dainippon Pharmaceuticals, to name a few. Foreign interests have also established a foothold in the region (i.e., Eli Lilly Japan, Nippon Becton Dickinson, Bayer Yakuhin). The Kansai BT base is supported by research seeds such as Kyoto University, Osaka University, Kobe University and The National Cardiovascular Center. Notable research facilities located in the region include the Kobe Medical Industry City, the Center for Advanced Genome Medical Research Development, the Institute of Biomedical Research and Innovation (IBRI), the RIKEN Center for Development Biology (CDB) and the Tissue Engineering Research Center. According to one survey, sixty-six percent of Kansais BT firms and institutions seek a partnership with foreign firms. Reasons for tying-up include joint research (both commercialization and basic), technological alliances (licenses), joint marketing and funding. Private equity hopes BT ventures will crystallize into real businesses and IPOs. One Osaka venture, AnGes MG Inc., receives much attention as an early IPO success. AnGes MG listed on the Tokyo Stock Exchanges Mother Index last year. While success stories remain few, Japans private equity still anticipates successful BT ventures in Japan. According to one source, the Kobe Biomedical Venture Fund has already invested in at least 18 companies. The fund was established in January 2001 to specialize in medical industries. Biofrontier Partners, headquartered in Tokyo, also placed bets on Japans BT industries. That firm, established in 1999, was reported to be the first Japanese venture capital firm to focus on life sciences. It is hoped that BT will have spill-over effects in the economy. For example, budding BT ventures may increase the demand for support services such as drug design platforms, BT-related devices and support services. CAN ANYONE TELL US WHY JAPAN'S TECH ECONOMY IS BROKEN? Is Japan's high-tech economy broken? We don't think so. Derailed perhaps. But if you understand the mechanics, you can gain access to amazing opportunities for business and technology in Japan. Nobody else knows Japan like we do. Find out what's going on, direct from Tokyo, weekly and free. Four great newsletters at http://www.japaninc.com. Outdated commercial laws and a shortage of legal and business consultants familiar with high technology and Western-style venture financing strategies plagued foreign investment during the recent e-commerce venture boom. Japans rigid legal system also failed to support flexible venture tools such as certain types of employee stock option plans, non-voting preferred stock, other creative stock classes, granting of third party options, etc. Venture capitalists found that their fast-paced business practices were stifled by other incomprehensibly rigid formalities such as the prohibition on board meetings by conference call.In the wake of an anemic economy and a short-lived boom in e-commerce before the collapse of the global Internet bubble, Japans national and local governments struggle to retrofit the economy for the 21st century. While closing companies outpace the number of new companies, national and local governments are taking steps to encourage entrepreneurs to develop new businesses. There are hopes that bio-tech or BT can help to revitalize the Japanese economy. In the late 90s, Tokyo boldly compared itself to Silicon Valley as a venture spirit took hold of Tokyo. In those days Japan seemed poised on the edge of a venture capital boom. The Shibuya Ward of Tokyo dubbed itself Byte Valley. Salaried business persons questioned their sunset careers at struggling trading companies, banks and electronics manufacturers while friends moved to venture companies, foreign PE and consulting firms, to ride Tokyos new wave of VC activities. Although Byte Valley died a young death it provided precedent for a belief that Japan can embrace venture capitalism. These days venture capital firms are not rare. There is even a Nippon Angels Forum, which has held numerous sessions in Japan attended by hundreds of investors. The forum has opened in fourteen Japanese cities. Perhaps the new wave of BT-venture is only a bubble right now, but it could be a tsumani. Japans BT industry is supported by a market said to be worth 1.33 trillion yen in 2001, and second only to a U.S. market of 3 trillion yen. By comparison, the combined European market has been estimated at less than 2 trillion yen. Even under current deflation, it has been estimated that Japans market could grow at a rate of over 7% annually. Andrew H. Thorson is a partner at Dorsey & Whitney LLP in Tokyo. His opinions may not necessarily reflect those of KWR International. Buyside Magazine reaches active institutional investors monthly with news and analysis of the equities markets. Buyside takes readers beyond news of the current business climate to report industry and market trends that are crucial for investors to understand -- not simply the latest business trends or product releases. Buyside and BuysideCanada are available in print, and online at www.buyside.com. Subscriber information is available on Buyside's home page. During the 1993-95 confrontation between the Clinton Administration and Japan over automobiles, the New York Times carried a new analysis which quoted Clinton Administration officials (unnamed) to the effect that if Japan persisted in refusing to grant measurable market access to U.S.-built vehicles, the inevitable result would be a weakening of both the economic and strategic relationships between the United States and Japan. Even the hint that trade conflicts could affect strategic relationships caused an uproar in both countries. Administration officials were quick to deny any such view, and Japan dutifully expressed its confidence that the strategic relationship was as strong as ever and that even the best of friends could have an occasional economic tiff without its threatening their friendship. A decade later, the current Administration has turned that equation on its head, and is directly linking foreign policy and trade policy in a series of actions that go far beyond anything contemplated a few years ago. The most notable example is the delay in the signing of the U.S.-Chile Free Trade Agreement after repeated promises by three Administrations over the last decade that Chile was next in line for an FTA. The Administration explains that it signed the Singapore FTA but has been unable to complete the Chile document because of English-Spanish translation delays. Similarly, the Administration indicates that it is unable to begin work on a U.S.-New Zealand FTA because of the sensitivity of some of the products that could be affected by those negotiations, despite the fact that those same products have been the subject of a number of bilateral and multilateral negotiations in recent years. Those two countries, of course, withheld support for the U.S.-led coalition of the willing against Iraq. The economic conflicts and tensions between the United States and the EU continue to increase almost daily. The latest is the U.S. WTO case on genetically modified organisms, but that is only one manifestation. The two trading partners are fighting over taxes, steel, agriculture, aircraft, and assorted other sectors. Those conflicts in turn threaten the success of the Doha Agenda negotiations on multilateral trade liberalization. Observers of the trade scene shrug their shoulders, claim everybody does it, and conclude this kind of behavior is a reality to be accepted. If this is true, it is a most dramatic and unfortunate development in trade policy. While it is realistic to expect that trade between nations whose relationships are openly hostile should not be robust, and that there should be economic consequences for such hostility, the same should not be the case when historic trading partners and economic allies have legitimate, and even difficult, disagreements over strategic policy. This is particularly true in the present global economic climate. The leaders of all developed countries, and at least the most enlightened developing countries, have embraced the concepts of open trade, multilateralism, trade liberalization, rules-based relationships, and globalization. They say they are committed to the principle that trade is the rising tide that floats all boats. There are a few nay-sayers who claim that open trade retards development, but in fact it is mercantilism and economic nationalism that undermine the real economic progress that trade liberalization unquestionably produces. Now we have added a third threat-- a foreign policy which is not perfectly symmetrical with that of the dominant trading partner. Dealing with the effects of mercantilism and economic nationalism is difficult enough without further burdening trade relationships with the notion of punishing partners because they take certain political stands. Whether one believes that Chile or New Zealand took the right stand in opposing U.S. actions regarding Iraq, both of these nations have essentially remade themselves into market economies, abandoned decades of trade protection, and opened themselves to outside investment. Their reward is to be brought to the edge of the promised land of bilateral trade liberalization and then told they may not enter. What message does this send to other countries contemplating such actions? If it is that disagreement with the United States over specific foreign policy goals cancels out all positive economic initiatives, many nations will ask whether the domestic economic upheaval is worth the risk. Other nations will look for alternative opportunities from trading partners who do not require political correctness as a prerequisite for an FTA. Ultimately economic and strategic relationships do go hand-in-hand, but they do not develop through negative reinforcement. This does not mean that recalcitrant nations should be coddled or condoned when they close markets or undermine U.S. foreign policy. There are trade rules for dealing with closed markets, and there are diplomatic avenues for addressing foreign policy differences. Going outside those rules and avenues to exact rough justice by withholding trade benefits assures that both the economic and strategic side of relationships will be weakened. The approach was rejected a decade ago, and it should be rejected just as decisively now. Russell L. Smith is a partner at Willkie Farr & Gallagher in Washington, D.C. His opinions may not necessarily reflect those of KWR International. Cuba  Still the Iron Hand: In March and April 2003 while the world was focused the Iraq crisis, Fidel Castro, Cubas longstanding socialist caudillo, flexed his regimes muscles and clamped down on local opposition groups. Although there has been speculation as to the creakiness of the Castro regime, the authoritarian Caribbean government demonstrated it was hardly down and out. In a well-planned roundup, close to 75 independent journalists, human rights activists and political opponents were arrested. Security forces charged the dissidents with conspiring with the chief of the United States Interest Section in Cuba, James Cason, and other U.S. diplomats to overthrow the government. The crackdown was given extra severity when three world-be hijackers apparently seeking to escape to the United States, were executed by security forces. The message from the Castro regime is clear  Fidel Castro is still very much in command, has no intention to liberalize the island-states political life, and regards the United States as intent on intervening in Cubas affairs. While local opposition groups were clearly cowered by the security crackdown, the Castro regime was roundly criticized by much of the international community. One casualty of the crackdown was a pending agreement with the European Union (EU), which would have given Cuba preferential terms for its products in the EU market. The EU had sought to engage Cuba, even opening an office in Havana earlier in 2003. The EU approach was that Castro could be induced by mutually beneficial trade agreements and foreign investment to gradually open up Cubas political system. Following the crackdown, the EU quickly signaled there was no longer a deal on the table. The Cuban government was highly critical, in turn, of the EU. However, it is the Cuban people that ultimately suffer, especially considering the economy is in bad shape, having expanded by only 1.1% in 2002. Dominican Republic  S&P Lowers the Boom: On May 15, 2003, Standard & Poor's put the Dominican Republics BB- on CreditWatch for a possible downgrade. The action was due to concerns over emerging problems at Banco Intercontinental (the third largest bank in the country), which could weaken political institutions and the external reserve position and reduce financial flexibility. Banco Intercontinental or BanInter has been a troubled institution for a while, but in April the central bank was forced to intervene after evidence of widespread fraud undermined plans to sell the bank. Matters became even more murky when on May 13, 2003 BanInters president was arrested and the government took over the banks companies. The government also confiscated the assets of its troubled banks major shareholders. S&P stated: The ratings on the Dominican Republic are constrained by low international reserves, shallow domestic capital markets, and relatively weak institutions and social indicators. The ratings are supported by tax and social security reform programs and a low and favorably structured public sector debt burden. Should these attributes be undermined by the contingent liabilities posed by the financial sector, a downgrade to B+ would be likely. We expect the government will scramble to resolve the problems related to BanInter, though there are concerns that the corruption around the bank could be deeper than currently anticipated. Costa Rica  Outlook Less Sunny: Costa Rica has been one of the more positive examples that a small country can broaden its export base, upgrade its soft infrastructure (i.e. people and their skills), and attract considerable foreign direct investment. While Costa Rica benefited from this package of developmental strategy throughout much of the 1990s and into 2000, the slowdown in the U.S. economy has hurt. As the government has sought to step in and help buffer the slower pace of exports, the fiscal deficit has widened. In May, the IMF released its annual review of the Costa Rican economy. While giving the Central American country credit for a number of reforms, the IMF was critical about the widening fiscal deficit, which could end up being equal to 4% of GDP in 2003. In 2002, the fiscal deficit was 5.4% of GDP, a substantial number. This prompted the government to introduce a tax package and tighten public spending. The governments fiscal deficit target is now set at 3.1% of GDP, which could be a little too optimistic. Shortly following the IMF release of the annual review, both Fitch and Standard & Poor's changed their outlooks for Costa Rica from stable to negative. Hong Kong  Reaching the Heights of Unemployment: The last two years have not been kind to Hong Kong. Deflation has become a major factor hanging over the economy, SARS has hurt tourism and retail sales, and there is considerable discontent with the government. The government estimates that tourist arrivals declined 77% in April after the World Health Organization advised travelers to stay away from Hong Kong. Tourism accounts for 6% of the citys GDP. The most recent piece of bad news was that Aprils unemployment rate rose to 7.8%, matching an all-time high. The main culprit was SARS, which kept consumers at home and drove away tourists. There have been around 8,000 cases of SARS worldwide, with the vast majority being in China, with Hong Kong having the second highest tally of cases. Expectations are that unemployment will most likely climb higher. HSBC and Standard Chartered Bank have recently cut their real GDP forecasts for 2003 down to 0.5%. This is a considerable slowdown from 2002, when the economy grew at 2.3%. Jamaica  Problems Mount: In recent years Jamaica has sought to implement structural reforms to make its economy work better. However, 9/11, civic unrest and a number of natural disasters have hurt the economy. In response the government of Prime Minister P.J. Patterson has opted for fiscal stimulus to keep the economy moving. This has caused the countrys debt burden to climb. Jamaicas debt expanded from 131% of GDP at the end of the previous fiscal year to 152% this year. In April the government advanced it budget, which included a J$13.8 billion ($246 million) tax package. Debt repayments will account for 65% of budget spending this year. Both S&P (B+) and Moodys are negative on Jamaicas outlook and in April the latter put the countrys Ba3 rating on review for a possible downgrade. Moodys stated: The review was prompted by Moodys heightened concerns over the Jamaican authorities apparent lack of policy options to quickly correct the fiscal deterioration that has occurred over the last 18 months. We believe Jamaicas Ba3/B+ ratings will fall, probably to B1/B in the medium term as tourism remains weak, international commodity prices (bauxite and sugar being topical to the Caribbean country) will underperform, and eventually interest rates will go up (most likely in 2004). All of this bodes ill for Jamaica. Singapore  Adjusted Growth for Q1 Up: The Singaporean economy expanded at a quicker pace than initially anticipated for the first quarter of 2003 as exports compensated for a decline in domestic demand. According to the Trade and Industry Ministry, real GDP for Q1 2003 was 1.1%, an upward revision from 0.7%. Unfortunately, the expectation is the Q2 2003 will not be as strong due to the negative impact of SARS on tourism and retail sales. Uzbekistan  Call for Reform: At the close of the annual meeting for the European Bank for Reconstruction and Development (EBRD), that institutions president, Jean Lemierre, took the bold stance of calling the host nation to adopt political and economic reforms. Without reforms, the Central Asian country could face cuts in the EBRDs financial support in 2004. Lemierre did not mince words as he urged President Islam Karimov to make radical economic and political changes, in particular, the end of torture in Uzbekistans prisons. In March 2004, the EBRD board meets to discuss lending to Uzbekistan. If improvements are not made, the board will consider curtailing funding facilities for the Central Asian government. This has already been done in the cases of Belarus and Turkmenistan, where authoritarian governments have blatantly suppressed political freedoms. Following the Asian Financial Crisis of 1997-98, there have been several efforts to explain the root causes of the event, and the lessons we might learn from it. In fact, an excellent web sight maintained by New York University Stern Business School professor, Nouriel Roubini, offers a daily chronicle of the causes and consequences of the crisis, and the various strategies devised to reduce the likelihood of a re-occurrence. In this edited volume, Griffith-Jones, Gottschalk, Cailloux and their contributors offer an overview of the crisis, a discussion of two other troubled economies at the time (Brazil and the Czech Republic), and a consideration of the various current proposals for a new international financial architecture. By comparison to most edited volumes, this one is more coherent and comprehensive. It is also well written and fairly jargon-free. But we would stress at the outset that it does not cover much new ground either, and would be most appropriate for a senior undergraduate or first-year graduate course in international finance or economics. Much of the volume is devoted to a review of the apparent causes and implications of the financial crisis in Thailand, Malaysia, Indonesia, and Korea, as well as Brazil and the Czech Republic. Particular attention is devoted to the role of banks in lending, and mutual funds in investing in the region in the late 1990s. This is fine as far as it goes. The authors come to the reasonable conclusion that the Malaysian policy of imposing capital and currency controls resulted in mixed results overall, and the fundamental strength of the Korean financial system allowed it to recover fairly rapidly. A great deal of attention is devoted to the relative merit of maintaining substantial official reserves, given the costs involved. But there is agreement that as a preventative measure, greater use should be made of both private and official contingency credit lines. Also, these funds should be made available before, rather than after, official reserves reach low levels. The various articles in this book make the reasonable case that high savings and investment rates do not prevent a country from suffering a balance of payments crisis. In fact, great deal of attention in the book is devoted to the risks associated with contagion. That is well and good, but we think that few strategies are suggested in this volume to deal with this terrible problem. Further, little attention is devoted to the moral hazard debate, which we think is central to investor perceptions of the crisis. On the other hand, the authors argue convincingly that better regulatory measures are key to avoiding future crisis. Most notably, they make the case that better international cooperation is required to reduce the risks of future crises. This is a solid overview of the Asian crisis and its aftermath. It deserves to be read by scholars in the field. But this will not be the definitive work on the topic. For anyone wanting to gain an easy access to Japanese history, written in an engaging fashion (with no footnotes), there is much to recommend Ian Burumas Inventing Japan. The author, an accomplished fiction and non-fiction writer, has studied and worked in Japan for a number of years and clearly has a deep respect and liking for his subject matter. In a series of biographical snippets, his essay follows the dramatic transformation of Japan, beginning in 1853 with the arrival of Commodore Matthew Perry and the Black Ships to 1964, when Tokyo hosted the Olympics, which symbolically allowed the Asian country to rejoin the world following the Second World War. While Buruma recognizes the darker side of Japanese history, he focuses on the countrys ability to catch-up with the West and to regain its role in the world following the disasterous defeat of World War II. He concludes that Japan is again at a troubled period in its history, due to a political establishment that deliberately stifled public debate by opting for a monomaniacal concentration on economic growth. And it is the result of an infantile dependency on the United States. Unlike some Japanese who have argued that it would be good for Japan to have new Black Ships shocking the country into action, Buruma thinks the Japanese themselves clearly have the ability to heal themselves and move. Altogether, a solid and useful read. Global Credit Solutions Limited provides a top-level service in the collection of commercial and consumer accounts, skip tracing, asset and fraud investigations and credit information on companies and individuals, globally. Visit them on the web at http://www.gcs-group.com or join their free monthly newsletter specially designed for credit professional and managers. © 2003 KWR International, Inc. This document is for information purposes only. No part of this document may be reproduced in any manner without the permission of KWR International, Inc. Although the statements of fact have been obtained from and are based upon sources that KWR believes reliable, we do not guarantee their accuracy, and any such information may be incomplete. All opinions and estimates included in this report are subject to change without notice. This report is for informational purposes and is not intended as an offer or solicitation with respect to the purchase or sale of any security.